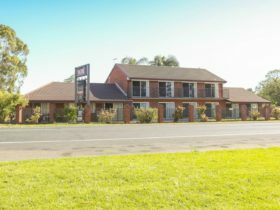 Situated on the banks of the mighty Murray River, Rivergardens Holiday Park Mildura boasts some of Mildura’s best riverfront holiday accommodation options. 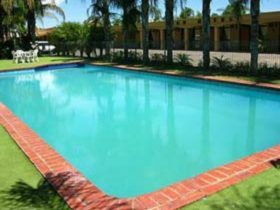 Whether you are looking for self-contained deluxe cabins or large powered caravan and camping sites Rivergardens Holiday Park has something to offer you. Located less than 5kms from Mildura’s city centre, the park claims Mildura’s best kept secret with stunning views and one of a kind river access. Moor your boat directly in front of your cabin and ski directly from the bank or perhaps you wish to cruise down to the Gol Gol Hotel or Trentham Estate Winery and enjoy a meal and a couple of drinks. Relax at Rivergardens in a quiet, tranquil atmosphere with no highway noise, enjoy the peaceful river, garden setting or choose to visit some of the best national parks and golf courses which are all at your doorstep. Make use of the parks fantastic facilities or explore the dozens of excellent attractions and dining options the region has to offer. These cabins have two bedrooms separate to the main living dining area and allow for a spacious and comfortable stay overlooking the river. Master bedroom has a queen bed and the second bedroom has two sets of bunks or a tri-bunk (double bed with single bunk overtop) with all linen included. They have a full kitchen with oven and full-sized fridge, sofa, dining table and chairs, television and DVD, reverse cycle air-conditioning and a furnished deck with car parking alongside. 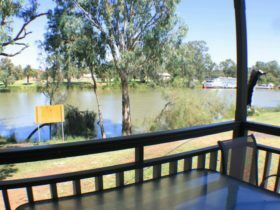 These two bedroom cabins are fully self contained including linen overlooking the Murray River. Master bedroom has a queen bed and the second bedroom has two sets of bunks or tri-bunk (double bed with single bunk overtop). Cabin has full cooking facilities including full-sized stove top, fridge and oven. Split system air conditioning, with undercover deck area. These two bedroom cabins are located one row back from the the river and allow for a spacious and comfortable stay. Master bedroom has a double or queen bed and the second bedroom has a tri-bunk (double bed with a bunk over the top) or two sets of bunks with all linen provided. 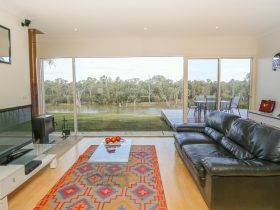 They offer a full kitchen equipped with microwave, oven and fridge, sofa, dining table and chairs, split system air conditioning and an undercover deck area with Murray River views. These cabin styles are ideally suited to a couple or a smaller family. Consisting of two bedrooms separate from the main living and dining area, they allows privacy, space and comfort for the entire family and only one row back from the river. Master bedroom has a queen bed and the second bedroom has two sets of bunks with all linen provided. They offer a kitchen with microwave, cook top, grill and fridge, sofa, dining table and chairs, and television. This newer modern style of accommodation is great for families, featuring two separate bedrooms with a queen bed in the main bedroom and either two sets of bunks, or a tri-bunk (double bed with single bunk overtop) in the second bedroom (all linen provided). The two bedroom Superior Cabins are in a quiet garden setting area within the park. Kitchen equipped with microwave, full oven and fridge, Sofa, dining table and chairs. These two bedroom cabins are great for families, located directly opposite the pool area. Master bedroom has a queen bed and the second bedroom has two sets of bunks with all linen included. They offer a full kitchen equipped with microwave, oven and fridge, sofa, dining table and chairs. The living area is complete with sofa, table and chairs, air conditioning, TV and DVD. The cabin has a furnished undercover balcony, perfect for enjoying those sunset dinners from the privacy of your very own Deluxe Poolside Cabin. Do you still want to go camping but want a few creature comforts? Then an Ensuite Site is for you. Enjoy your own bathroom, town water and sullage with either slabs or matting on level shady sites and access to all facilities. These level and shady powered sites have town water and sullage with either grass or matting and access to all facilities. These shady grass sites are close to all amenities and facilities. Prices include the first two guests with an additional rate applying for extra persons.